New Delhi: As India prepares to welcome back Wing Commander Abhinandan Varthaman, who was captured by the Pakistan Army after a dogfight along the Line of Control (LoC) Wednesday, a video claiming that he was seen dancing with Pakistan military has gone viral on the internet. The two-minute long video shows military officers in two different uniforms dancing. It has been widely shared on social media portals like Facebook and YouTube and is also being forwarded on messaging service WhatsApp. 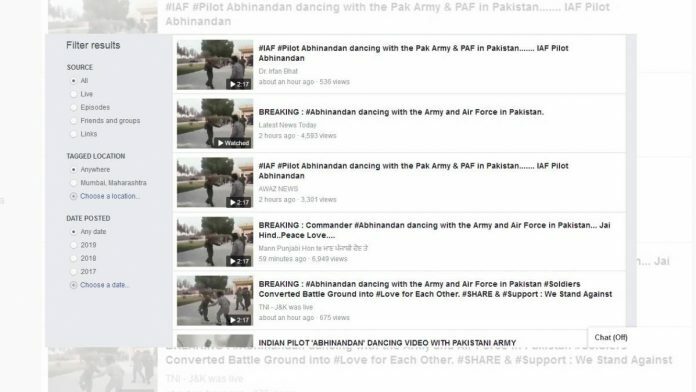 It was shared by Facebook page Lazawal and the text accompanying the video reads, “IAF Pilot Varthaman dancing with Pak army and PAF in Pakistan.” The post received over 500 shares. The video shows a man in an olive coloured uniform, sporting a moustache, dancing with Pakistan Army officers. A close look at the low quality video also shows that the officer in the olive coloured uniform, being touted as Varthaman, actually belongs to the Pakistan military. He’s sporting the Pakistan Flag on his uniform. Moreover, Varthaman doesn’t resemble the officer seen dancing in the video. A lot of fake videos have made their way to the internet ever since tensions between India and Pakistan escalated this week. A video of an army officer’s wife was also circulated on social media Wednesday, claiming it was Varthaman’s wife. However, nowhere in the video does the woman reveal her identity as such. Just when you think Rahul Gandhi’s Congress can’t stoop lower, they breach their own record. Varthaman is scheduled to cross over the Wagah border Friday.